Scientists Worry About Impact Of Bird Flu Experiment Scientists are worried about the deadly bird flu called H5N1 which sometimes infects people. It's never acquired the ability to transmit easily between humans, but researchers would like to know if that could happen. Recently, they've essentially been altering the genes of H5N1 to make the virus spread more easily between lab animals — raising concerns about biosafety and how this research is regulated. Scientists are worried about the deadly bird flu called H5N1 which sometimes infects people. It's never acquired the ability to transmit easily between humans, but researchers would like to know if that could happen. 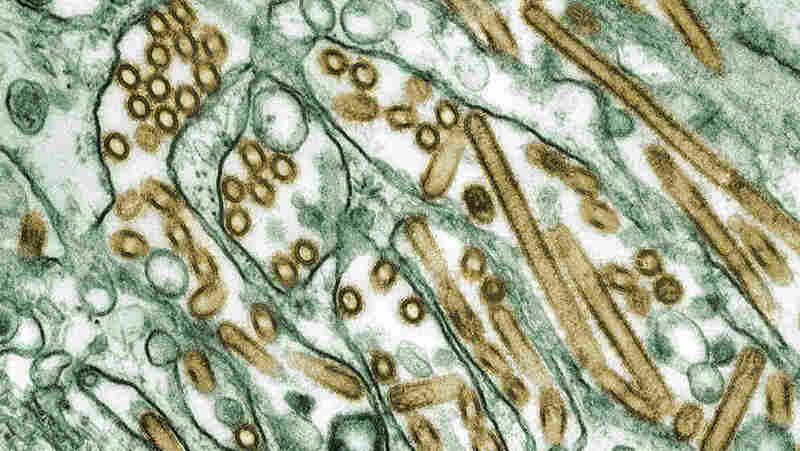 Recently, they've essentially been altering the genes of H5N1 to make the virus spread more easily between lab animals — raising concerns about biosafety and how this research is regulated. It's MORNING EDITION from NPR News. Steve Inskeep is visiting our member station WABE in Atlanta today. I'm Renee Montagne. Scientists and public policy experts are in the midst of a fierce debate over questions raised by recent experiments on a strain of bird flu virus. The virus has not caused widespread human disease, but biologists worry it could change in ways that could lead to a devastating global pandemic. In an attempt to stay ahead of the virus, they've been tweaking its genes in the lab, to learn more about how it works. But critics say these experiments could potentially reveal how to make new bioweapons, and some results should not be public. NPR's Nell Greenfieldboyce has our report. NELL GREENFIELDBOYCE, BYLINE: As its name suggests, bird flu mainly infects birds. But in recent years, the H5N1 virus has also infected about 500 people. More than half died. So far, sick people haven't been very contagious, so there hasn't been a worldwide pandemic. That could happen, though, if bird flu evolves in a way that lets it spread between people as easily as regular flu. Researchers need to understand what kind of changes this virus is capable of. In September, one scientist made a stunning announcement. At a flu conference, he said he'd done a lab experiment that resulted in bird flu virus becoming highly contagious between ferrets, the animal model used to study human infection. It seemed that just five mutations did the trick. News of this experiment raised red flags for Thomas Inglesby. He's a bioterrorism expert, and director of the Center for Biosecurity at the University of Pittsburgh Medical Center. THOMAS INGLESBY: It's just a bad idea for scientists to turn a lethal virus into a lethal and highly contagious virus. And it's a second bad idea for them to publish how they did it so others can copy it. GREENFIELDBOYCE: So far, no science journal has published it. Inglesby hopes none of them do. Biology usually has a culture of openness. Scientists report their methods and results so others can repeat their work and learn from it, and Inglesby agrees that's the way to go 99.99 percent of the time. INGLESBY: But there are some cases that, I think, are worth an exception to that otherwise very important scientific principle. GREENFIELDBOYCE: He says this looks like one of those cases. INGLESBY: I can only imagine that the process of deliberating about the publication of these findings is quite serious. GREENFIELDBOYCE: The scientist who presented the results of this study is Ron Fouchier, of the Erasmus Medical Center in the Netherlands. NPR has learned that his work is now under scrutiny by a committee called the National Science Advisory Board for Biosecurity. That's a committee of independent experts that the U.S. government set up to give advice on how to deal with biological research that's legitimately important to science, but that also could be misused. It can make recommendations about things like whether or not to publish. NPR asked Fouchier by email if he intended to publish the details of his study. He replied that he preferred not to comment until the committee made a formal decision. One security expert says research on new and worrisome forms of influenza is a case study showing how a decade after 9/11 and the anthrax attacks, scientists are still grappling with how to handle sensitive biological research. John Steinbrunner is director of the Center for International and Security Studies at the University of Maryland. JOHN STEINBRUNNER: We really do need to develop a better oversight process, and a better way of organizing global judgments about very, very dangerous lines of research. And we haven't yet done it. GREENFIELDBOYCE: Scientists say they do think about these issues and take them seriously. Lynn Enquist is a Princeton University professor, and editor-in-chief of the Journal of Virology. He says he and his colleagues carefully considered whether to publish a flu study that appears in the December issue. LYNN ENQUIST: You have to say, is there more benefit than there is risk? And that was our judgment on this one, that that was indeed the case. GREENFIELDBOYCE: In this experiment, researchers had taken a bird flu gene and put it in the swine flu virus that started spreading between people a couple of years ago. Mice infected with this lab-created virus got very, very sick. But Enquist says the altered virus didn't spread easily. He points out that this kind of virus combination could happen as bird flu circulates out in nature. ENQUIST: Scientists in the United States, and all around the world, are very curious as to how this thing is going to evolve - because we have to be prepared for it. The public would expect us to be prepared. GREENFIELDBOYCE: Scientists from the Centers for Disease Control and Prevention have been doing work to see how bird flu could adapt to humans. This month, in a different virology journal, they described how they created two new versions of the bird flu virus that could spread between ferrets in a limited way. A spokesperson said no one from the CDC would be made available to comment. Efforts to speak with officials at the National Institutes of Health, which funds flu research, were unsuccessful. Nell Greenfieldboyce, NPR News. H5N1 avian flu viruses (seen in gold) grow inside canine kidney cells (seen in green). The H5N1 virus has been circulating among birds and other animals in recent years. It's also infected about 500 people. More than half died. But this dangerous virus has not caused widespread human disease because, so far, sick people haven't been very contagious. In September, one scientist made a stunning announcement. At a flu conference held in Malta, he said he'd done a lab experiment that resulted in bird flu virus becoming highly contagious between ferrets — the animal model used to study human flu infection. It seemed that just five mutations did the trick. It's just a bad idea for scientists to turn a lethal virus into a lethal and highly contagious virus. And it's a second bad idea for them to publish how they did it so others can copy it. "It's just a bad idea for scientists to turn a lethal virus into a lethal and highly contagious virus. And it's a second bad idea for them to publish how they did it so others can copy it," says Inglesby. Inglesby agrees that's the way to go the vast majority of the time. But not this time. "There are some cases that I think are worth an exception to that otherwise very important scientific principle," he says. "I can only imagine that the process of deliberating about the publication of these findings is quite serious." That's a committee of independent experts the U. S. government set up to give advice on how to deal with biological research that's legitimately important to science but that also could be misused. It can make nonbinding recommendations about such things as whether the findings should be published. "We really do need to develop a better oversight process and a better way of organizing global judgments about very, very dangerous lines of research," says Steinbruner. "And we haven't yet done it." Scientists say they do think hard about these issues. Princeton's Lynn Enquist, editor in chief of the Journal of Virology, says he and his colleagues carefully considered whether to publish a flu study submitted to the journal that appears in the December issue. "You have to say, 'Is there more benefit than there is risk?' and that was our judgment on this one, that that was indeed the case," says Enquist. But Enquist says, this altered virus didn't spread easily. And he points out that this kind of virus combination could happen as bird flu circulates out in nature. "Scientists in the United States and all around the world are very curious as to how this thing is going to evolve because we have to be prepared for it," says Enquist. "The public would expect us to be prepared."